Use an Arduino and an ESP8266 module to control a servo motor through a webpage. In this project, we are going to control the servo motor through a webpage. The webpage will be created using an ESP8266 module and, by moving the slider on the webpage, the servo motor will move accordingly. First of all, connect the ESP8266 with Arduino. 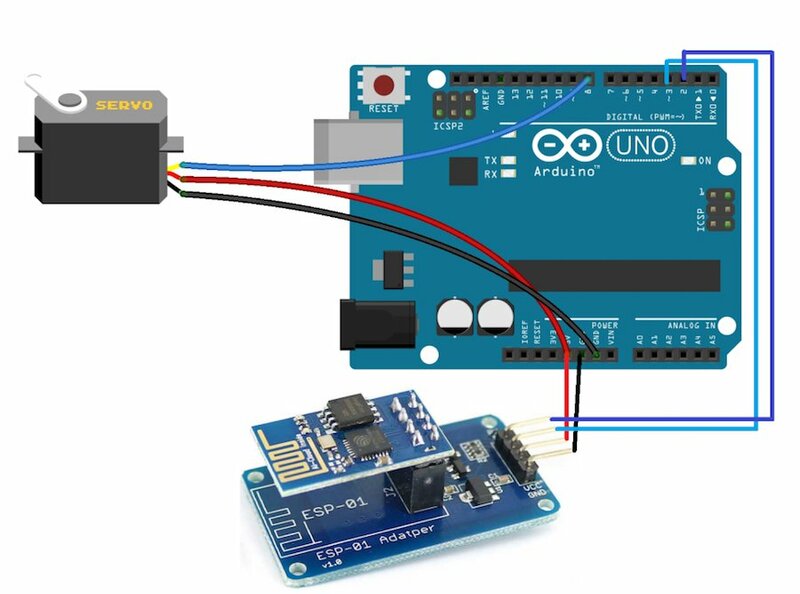 We have used an adapter to connect the esp8266 with the Arduino, which will make the connection much easier. The adapter has 5 to 3.3V regulator and you don’t need to connect any external resistors with it. Type this IP address in the space given on the webpage. Now, when you move the slider, the servo motor will move. First of all, include the libraries for the software serial and for the servo. The software serial library will help us in using the TX and RX communication on other pins of the Arduino. The servo library will help us in moving the servo easily. After that, we defined the pins where we have connected the RX and TX from the ESP8266 and then we defined the pin where we attached the servo motor. After that, we define the pins where we have connected the RX and TX from the ESP8266 and then we define the pin where we attached the servo motor. Then in the setup function, we tell the Arduino which pin we have connected the servo motor to and we moved the motor to the maximum position. Then we set the baud rate for the serial communication and the esp8266 at 9600. Set the baud rate of esp8266 according to your esp8266’s baud rate. Your esp8266 might have different baud rate. Then we set the baud rate for the serial communication and the ESP8266 at 9600. You'll need to set the baud rate of ESP8266 according to your ESP8266’s baud rate. Your ESP8266 might have different baud rate. The following commands connect the ESP8266 to your Wi-Fi network and set the webserver at the IP address and port. It will show this in the serial monitor after uploading the code. The Arduino will see if the data is available or not. If the slider on the webpage is moved, then the ESP8266 sends the data to the Arduino according to the slider moved. The Arduino moves the servo motor according to the value given by the ESP8266. The following function sends the commands to the ESP8266 and will print the response of the ESP8266 on the serial monitor.